Wasted Talent is a gritty documentary where director Steve Stanulis and producer Noel Ashman together examine the temptations and struggles many young celebrities go threw on their rise to stardom. It focuses on the story of actor LIllo Brancato who was once considered to be the next Robert De Niro, after his huge success starring in the films A Bronx Tale(De Niro’s directorial debut), Renaissance Man, Crimson Tide and the classic tv show The Sopranos. 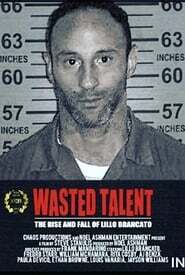 However Brancato got trapped in the underworld of hollywood instead becoming a drug addict culminating in his arrest for the murder of a new york city police officer on a drug excursion gone horribly wrong. Though Brancato was cleared of the murder charge, he still did eight and a half years in jail on an attempted burglary conviction. During his time in prison the young actor was finally able to get clean and sober, and is now struggling to redeem himself in the fickle world of entertainment. Anne Clark, an icon of music history and a terrific pioneer of spoken word art, has been on stage for more than 30 years. It transforms language into unique music….